Philadelphia&apos;s restaurant renaissance, which sources date to 1997 in Old City, completely transformed the local wine-and-dine scene, taking menus in bold and exciting directions and catching the eye of foodies worldwide. It also had a ripple effect on the surrounding suburbs, including Montgomery County. Pockets of plated perfection began to spring up routinely in communities such as Ambler and Skippack. In shedding its former mill town roots, Conshy has become a go-to spot for dining, offering varied menus, ethnic specialties and finely tuned potables, all concentrated in an inviting, walkable setting. 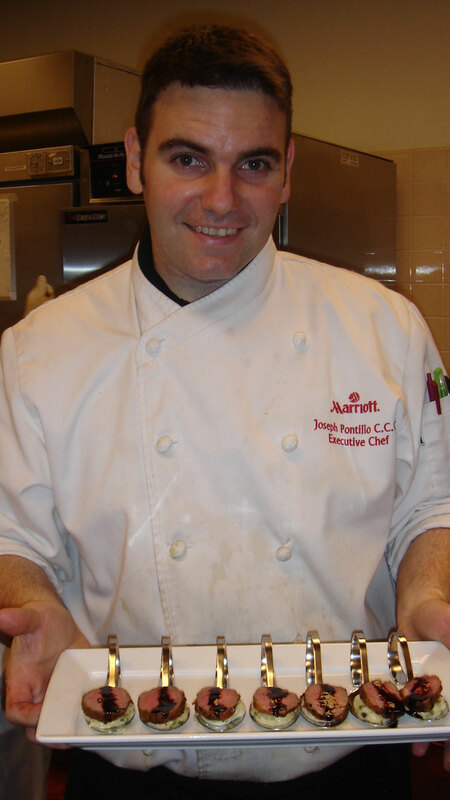 Witnessing this transformation - and contributing to it as well - is Joseph Pontillo, who wields his spatula at the Philadelphia Marriott West, serving as both Executive Chef of the property&apos;s catering trade and Legends Sports Bar & Grill. His training began at age 12 or so in Northern New Jersey. "I used to mess around in the kitchen when my mom would have people around for mahjongg. That&apos;s my earliest memory of cooking, making little treats and stuff like that when she had her friends over," he remembers. His career in the kitchen got a further kick start from his father. "One day, my dad went out for Chinese food and came back with a job for me. I started the next day at the take-out place. I never worked in a kitchen, but they needed someone who spoke English. So I started by answering the phone and filling orders. I then started making things like wonton soup and eggrolls. I had to learn how to say most of the menu in Cantonese." In addition to the rudiments of a second language, Pontillo also learned excellent knife skills, a talent that came in handy when he eventually went to the Culinary Institute of America. But his carry-out experience left him shaky on a few necessities when it came to technique: "We never used sauté pans," he admits. "We always cooked on a grill or a flattop or something like that in the restaurants I worked in. So tossing things in a sauté pan was an interesting challenge." Through practice and patience, proficiency came. Pontillo arrived in Philadelphia in 1999, accompanying his soon-to-be-wife as she attended Philadelphia University. He had to adjust some of his specialties to fit local tastes. "Coming from New York, we were doing things there that hadn&apos;t caught on here. Especially in the banquet and hotel settings. I had run what was judged to be the best buffet in Manhattan for a Sunday brunch. And from there, I came here, where I was asked for a lot of cheesesteak buffets. At first, stuff like that hurt my culinary ego a little. But I continued to learn a lot." Pontillo, ascribing to the truism that a rising tide lifts all boats, is excited to see the restaurant scene in Conshohocken gain its culinary footing. "There are some really nice places opening up in the suburbs," he reflects. The Plymouth Meeting, Conshohocken, King of Prussia area - even out into Wayne - is getting very nice. I don&apos;t have to go downtown for an evening to go out. Even if it&apos;s just down the street to Blackfish or over to Arugula [Ristorante at Cold Point] in Plymouth Meeting. There&apos;s lot of really good choices. A lot of people doing a really good job. They have a lot of pride in it. And here, we try to keep up with that to try to steer outside of the typical stereotype of hotel food." Cooking for Conshohocken guests is one thing. Cooking for family is another. Does Pontillo&apos;s wife and family benefit from 25 years&apos; experience in creating memorable meals? "My wife does most of the cooking and shopping at home," Pontillo admits. "Unless it&apos;s a birthday or special occasions or people coming over. Then I&apos;ll pull it together." The Food & Dining information on valleyforge.org is a great place to survey our current menus. Chefs like Pontillo are flexing their creative muscles every day, creating appetizers, entrees and desserts that reflect cultural backgrounds worldwide. As you sample the products of their talents, be sure to post your photos and status updates using #MakeItMontco. Share your favorite places, so that others can enjoy your discoveries as well.